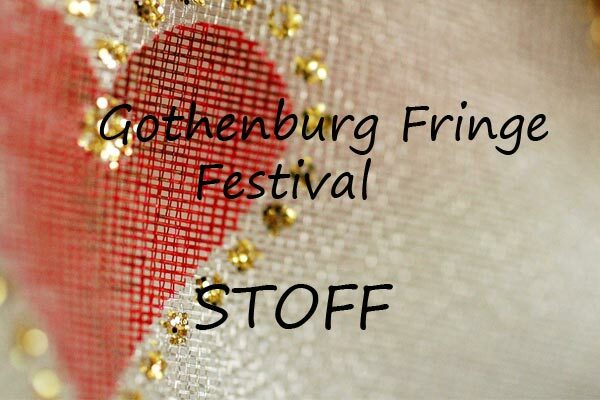 For Free in Gothenburg - find free events and entertainment in Goteborg. For free is nice, and there is a lot to discover that that does not cost anything but is completely FREE in Gothenburg. Some are free by season but some valid all year round. Summer is the best time for free activities in Gothenburg. It can be anything from festivals, music, museum, Sweden's National Day, film, etc. Here we have gathered some of the things that is for FREE for you. Many museum in Gothenburg have free admission for children and adolescents. Sometimes it may be that it can bee free during specific days. Gothenburg City Museum is an interesting museum about the history of Gothenburg from the little town it once was to today's big city. The museum is located in one of Gothenburg's oldest buildings, the East India House from the 1750s. There is also a nice cafe and shop. There is free admission for all under 25 years old. 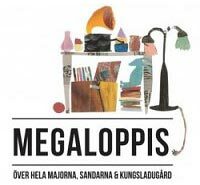 Annual entrance, 4 museums: If you are an adult (25 years and older) you pay 100 sv kr and then you get an Annual entrance admission of the year and you get in for free at the following museums: Gothenburg Art Museum, the Röhsska Museum, Gothenburg City Museum, Maritime Museum. Sjöfartsmuseet Akvariet:Closing temporarily in September 2018 for extensive rebuilding. Opens again 2021.Röhsska museet: Temporary closed for renovation. Planned opening in autumn 2018. Concert in the Foyer 2019 & music during Culture Festival. 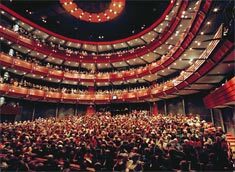 Opera always offer free concerts during spring. This year it will be on the following dates: 27 Jan, 16 mars, 13 April (2019). During the Gothenburg Culture Festival Aug 6-11 aug 2019 is the Gothenburg Opera always open and offers a free evening concert on the main stage. 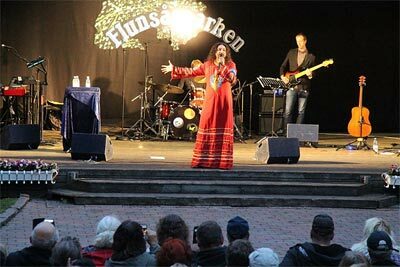 There will also be time for the traditional concert at Götaplatsen during Summer. Warm welcome! 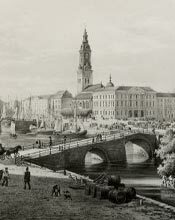 festivities in Gothenburg, which has become one of our signs of spring. International Science Festival in Gothenburg is a recurring event with approximately 300 program items with free entries. The festival mixes science and culture in the fun way. There will be everything from space, nature, animals, the earth's climate to selfies and zombies. 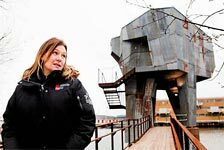 The festival is spread out all over town at places like Bältespännarparken, Göteborgs Konsthall, Blue site (Angered), Bio Roy, the Maritime Museum, the City Library and many more. There is free admission for all. First come first served, due to limited laces. 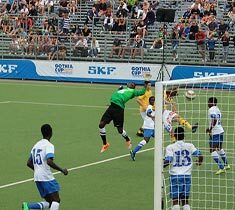 Gothia Cup is a football tournament which has existed since 1975. From being a minor tournament has grown to be the world's biggest football events where young people from all over the world participate. The opening ceremony attracts the largest audience that it is held at Ullevi. 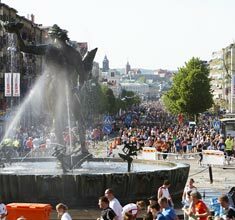 During Gothia Cup is a lot happening in the town, and everyone is welcome to visit the event areas, Heden is the biggest area were many football games are held. You can watch the games for free. In the Göta Älv, you can go with Älvtrafiken. Line 285 (Älvsnabben) runs between Lilla Bommen and Klippan (at Älvsborgsbron). On this line, you pay Västrafiks tariff. However, it is free to go on the line 286 (Älvsnabbare) that crosses over the river between Stenpiren (Rosenlund) and Lindholmspiren. Bicycle you can also bring on board free. It's not a long way to go, but can be a nice outing from the city center and come out a bit on the river and then take a stop at Lindholmspiren. When yhou arrive you can visit the restaurant school Ester Mosessons Gymnasium and here you can peek in on a coffee or lunch. 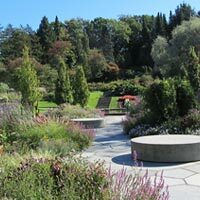 Gothenburg has many beautiful parks to enjoy the tranquility of. In summer you can bring a blanket and picnic and just be. Stroll among the beautiful flowers in the spring. In autumn trees change color. In winter you can sit at one of the cafes and have a warming cup of hot chocolate (some Parks are just open on a specific season). The park is located in the heart of Gothenburg, between Drottningtorget and Bältespännarparken (Grand Theatre). Truly an oasis that we like very much. Café. Free admission to the park. Already in November 2014, Göteborgsvarvet 2015 fully subscribed by about 64,000 runners who want to run the race. Göteborgsvarvet is a half marathon (21 km) which has become widely known in the whole world. It runs boys and girls of all ages from all over tghe world. Some runs to win and some just run to have fun. Prepare yourselves in many fun costumes at the track. For those of us who do not run it as much fun to watch. The festival is free for spectators. The start is at Slottskogen Park and the finish is in the historic Spot, Slottskogsvallen. Go Go! Multiple small races in May: May 19, Small Lap Run (7-13 years) and May 19 - Mini Lap Run (0-6 year). boxing, wrestling, gymnastics, shooting, climbing, rowing, indoor banding, rugby, dance, frisbee and more. Free admission for all children up to 16 years and their guardian on registration. 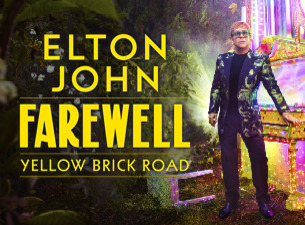 Last Sunday in May - May 26 -2019 - at 11am - 5 pm. bargain or simply soak up the atmosphere. 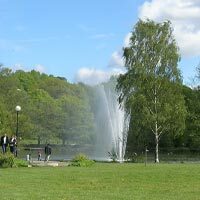 During Sweden's National Day, you can enjoy wonderful music in the green when the Gothenburg Symphony Orchestra (GSO) moves in and out of Slottskogen for a concert. Bring your blanket and bring something good to eat and enjoy. Hopefully, good weather and beautiful music. 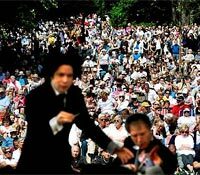 The concert has become a tradition in Gothenburg and attracts many spectators. Please come in good time. During week 27, every summer since 1994 the Iland Marstrand and water outside, transformes for a week of match racing competitions filled with festivities. Several of the world's top male and female sailor participating in the regatta in Marstrand. Match Cup Sweden has also, since 2007 World Championship status as one of the races in the World Cup series World Match Racing Tour. buy what is offered on site. 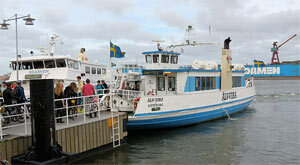 You can´t buy your ticket on board, buy it in the Kiosk located beside the Ferry. 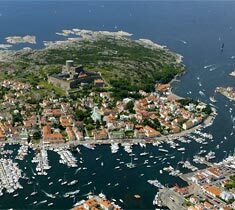 Photo: Marstrand. Photo: Stena Match Cup Swedens hemsida. One week with much fun events in Gotheburg: Aug 3-10 augusti 2019 in cooperation with European choir games. 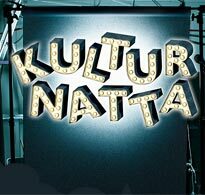 Culture Festival in Gothenburg is a tradition that welcomes all to the festivities in town and vicinity. There are free concerts, dance, theater, film, marketing, exhibitions, shows and lots of good food. Everything at the Culture Festival is free to take part in, except that which is sold in markets and restaurants. 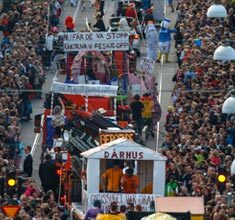 Gothenburg Culture Festival is one of Scandinavia's largest cultural festivals and is visited by about 1.3 million visitors. Party Places are among others Heden, Royal Square, the Avenue, Castle Forest, Gustav Adolfs Torg and the Port of Gothenburg etc. 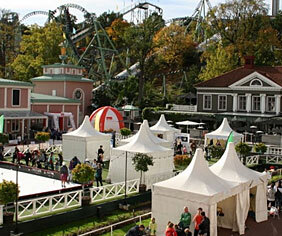 Liseberg has free entrance some of the days during the Culture Festival. This year the same date as West Pride. Some will cost entry but much will also be free to visit. chickens and hens. It is also allowed to go in and pet the animals. At the Children's Zoo is also staff who can tell you more about the animals. 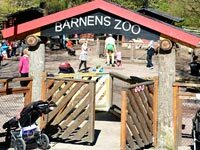 Free entrance to Childrens Zoo. 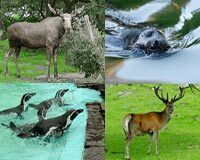 In Slottskogen are in addition to the Children's Zoo also other animals such as moose, seals and penguins. In a house with a swimming pool Humboldt penguins live and in another basin lives the park's harbor seals. Harbor seal is the West Coast's friendliest seal. Then we have the king of the forest, moose. Free entrance to the Zoo. sound and light installations, theater, photography, flea markets, exhibitions, film, dance and much more. It usually begins towards the afternoon and runs until 24:00. This year is a special year. The National Archives was founded for 400 years, and it is 50 years since the Archives of the Movement started and even the Archives Day is 20 years old. 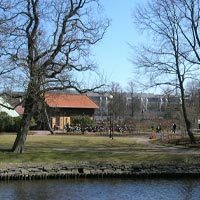 As part of the creation of the Jubilee Park in Frihamnen a sauna was built. The sauna building is clad of used plates and is anchored out in the river. The sauna can accommodate up to 30 people and you will come up via stairs or elevator. Through a window you get a beautiful view of the harbor and towards the center. The idea is that the sauna should be for everyone because it is free to make an appointment to it. Times can be booked separately by men, women and friends. At Red Stone Art Gallery you can work with your creativity. For those who are interested in art and creativity, you can attend free workshops at Red Stone Art Gallery. The meeting place is called Young & Creativity, and is intended for those who are between 12-26 years. 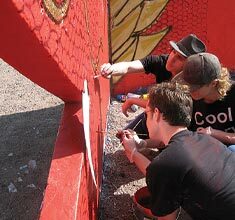 Topics can include screen printing, graffiti, letters, painting, self portrait, etc. get to test various art activities. Fun for children and adults together. These event costs. With reservation for any changes in the content and prices.